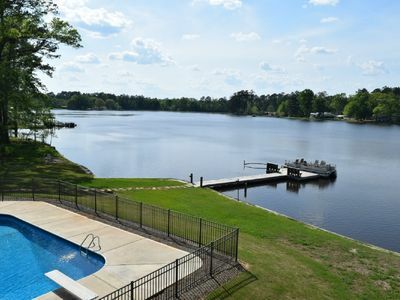 Beautiful 5 bedroom home on West Point Lake. Our home is located in one of the best coves on the lake! 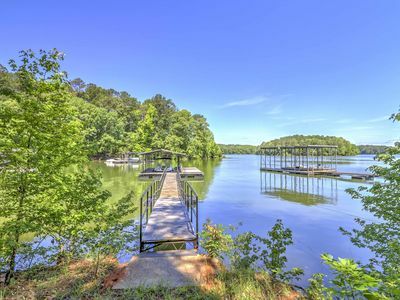 Swim, fish, ski, hang out on the beautiful custom built dock, or relax on the sandy shore! Master bedroom with king on main level. Four bedrooms upstairs (three queens, one full). One queen size inflatable mattresses available for additional guests. Two full baths upstairs! Newly remodeled kitchen and great spaces to hang out on the deck or in the back yard! Wonderful firepit with plenty of wood! Gas Grills available on deck and at the dock! Come relax and enjoy a week of fun with your family or friends! A bottle of wine awaits you upon arrival! Whether you're coming to enjoy the lake on a hot summer day or just spend time with family or friends it’s the perfect place to make wonderful memories that will last a lifetime. Check out all the backyard games and ski equipment that are available for your use as well as 2 kayaks for exploring the cove . Even though the lake is a short walk there is golf cart available for those who may want to use it to and from the lake or to carry coolers etc . We take great pride in providing a place that is clean and well appointed so you have everything you need !! For Promotional Pricing please contact Property Manager to see if your stay qualifies. This 3 bedroom Lake Point Chalet is located at Highland Pines Resort and Marina and is over 1400 square feet and features two master bedrooms complete with their own private master baths. 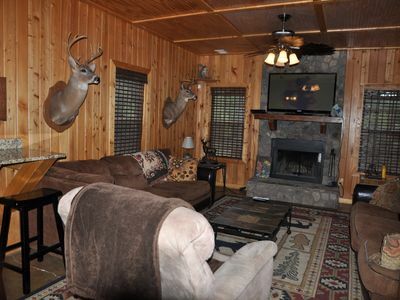 Upstairs you will find a 300 square foot loft with two full log beds, log dresser and sitting chair. 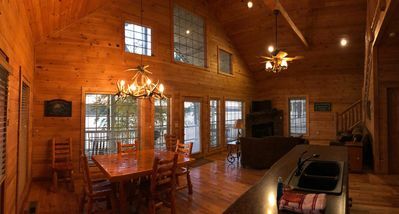 The view from the loft out through the upper front Chalet window is perfect for viewing all the activities on West Point Lake! 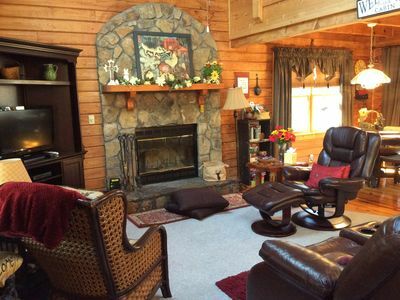 The Chalet features vaulted ceilings with knotty pine interiors, 37” Flat Panel HD TV. Antler chandaler, Antler table lamps, hick hardwood and ceramic floors, and a cozy gas fireplace. The master bedrooms are complete with cedar log furniture, queen size pillow top beds. The kitchen is fully equipped with all appliances including dishwasher, cedar log dining set and hick cabinetry. The huge waterfront deck is equipped with a charcoal grill. This Lakeside One-Bedroom cabin has all the comforts of home with a fully equipped kitchen, full size bed and a pull-out sleeper sofa, central heating and air. This cabin comfortably sleeps 2 adults and 2 children. 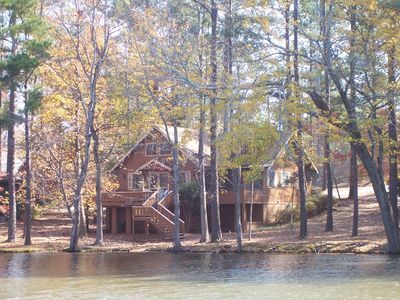 You will enjoy the spectacular view of West Point Lake from the private water front porch. Your family can grill and watch the beautiful sunsets from the comforts of your private cabin. While your family is here at Highland Pines Resort and Marina we welcome you to enjoy our sandy waterfront beach, exercise on the mile of hiking trail that border the West Point Lake. 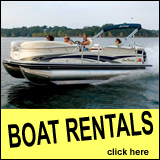 We offer a variety of rental boats from bass boats to fishing pontoons and luxury pontoon boats. If boating is not for you we welcome you to fish from the banks among the 200+ acres of waterfront property. To see if your families stay qualifies for promotional pricing please contact Property Manager. This two bedroom 1.5 bath Waterfront Chalet is over 1000sqft and features vaulted ceilings with knotty pine interiors HD LCD TV, antler chandelier, antler table lamp hickory hard wood and ceramic floors and a beautiful gas fireplace. The Master bedroom is complete with a master bath and both bedrooms have HD LCD TV and feature cedar log furniture. The Kitchen is fully equipped with all appliances including dishwasher, cedar log dining set and hickory cabinetry. 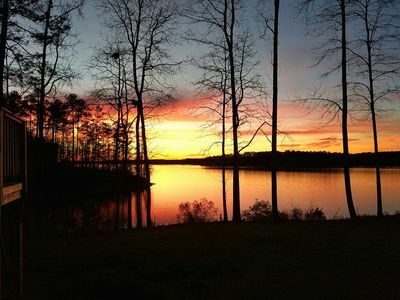 It is located on Highland Pines Resort and Marina main lake point for the most unbelievable sunsets ever. You will have access to the resorts 200 acres, hiking trails, rental boats, beach and all amenities. To she if you qualify for promotional rate please contact the resort. 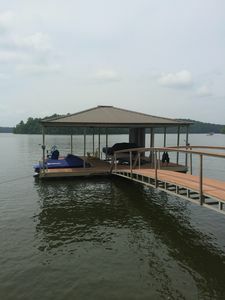 This 2 Bedroom cabin Floats in the middle of the boat dock at our Highland Pines Resort and Marina giving you the ability to literally roll out of bed and into your boat, or fish from your porch all night! 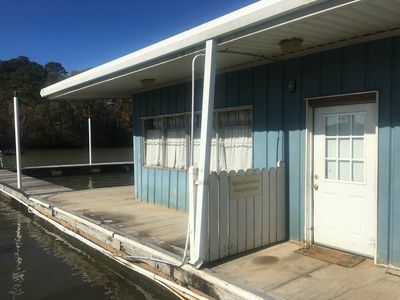 The Floating Dock House is a two-bedroom, one bath floating cabin equipped with all the comforts of home with a full kitchen, a den with TV, central heating & air and heat, and a porch that cant be beat. There is a full bed in one bedroom and two twin beds in the other. To see if your families stay qualifies for promotional rates please contact the property manager. This 3BR 2BA house has just undergone a major renovation and you can tell. From the beautiful hardwood floors to the massive master suite shower to the brand new appliances, this house is ready to entertain. The main room features a vaulted ceiling with wood beams spanning from side to side and a hardwood floor to pull it all together. The downstairs has two bedrooms, one with a king bed and the other with a full over full bunk bed with a trundle pull out. The upstairs master suite has a king bed and enough room for a large blowup mattress (included upon request). 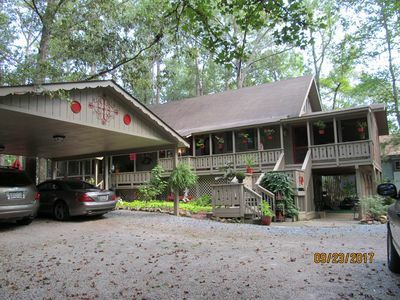 This home offers a perfect setting for a family retreat or lodging for a fishing tournament. Upon arrival, be sure to take a minute to relax on the screened porch or stretch your legs by take a walkabout down the trails through the woods. Our plot of land backs up to core of engineer property that is protected - this land is full of wildlife you can observe from the back porch. The dock is about 150yds from the house and can be accessed by following a trail to the lake that starts right out of the back door. There is no cable at the house. There's a Smart DVD player with our Netflix and Hulu subscriptions available. It should be noted that the driveway is gravel and discretion should be used. If necessary you can park on the street in the cul-de-sac and access the house via a short trail. Please note that the dock is a shared family dock and my parents keep their boat there. There is a separate trail they use for dock access so privacy at the house is not impeded. Check in is between 3pm and 8pm. Check out is 10am unless discussed otherwise. Beautifully renovated lake-side villa located on the Weehadkee creek inlet in West Point Lake. Guests are greeted with lush landscaping and gorgeous panoramic views as they pull onto the property. Once inside, experience the breathtaking décor that immediately makes you feel at home and induces an instant feeling of relaxation and comfort. Consider yourself blessed with a cozy master bedroom on the main level with a large en-suite complete with a dual vanity and large walk in closets. Sit and read a nice book while your honey whips up some groceries in the adjacent open concept kitchen with great counter space. 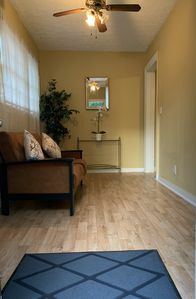 Downstairs is a finished basement with 3 additional rooms for the kids or other family members. Downstairs also includes another living space with kitchen and laundry room complete with functioning washer and dyer. Outside is a LARGE patio with plenty of covered seating and a large brick grill for those meat and poultry lovers. A tranquil walk down a cleared path will lead you to the lake which features a large covered dock with electricity and water. You will NOT regret booking this gem!!! 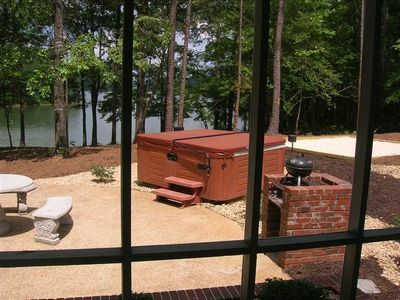 This is a nice private ranch house overlooking it's own 4 acre lake with a private dock and use of a boat. 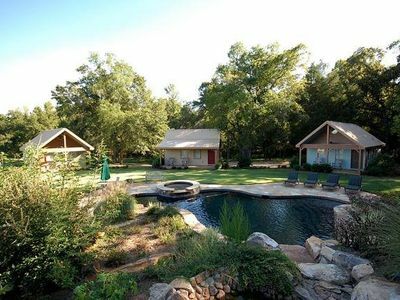 Nestled on 15 acres with hiking trails around the property. 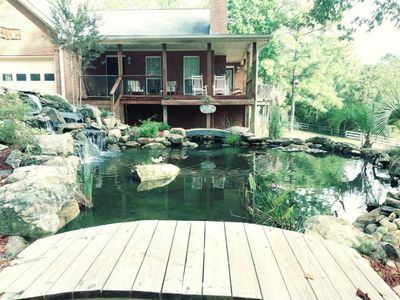 deck overlooks not only the lake but a huge Koi pond and beautiful waterfall. This is a vacation in itself, a place to unwind, relax and reconnect! 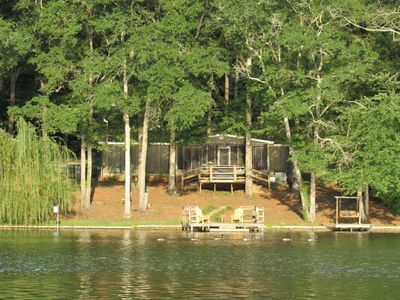 Fish, Hike, Swim, or set by a beautiful camp fire overlooking the lake in the evening. Large HD projection screen for sports or movies. No other guest in house . More information about Other things to note: Group events, family gatherings or parties will have to be discussed with host and possible additional charges applied if event is approved. his place is nicely furnished and cozy. Sleeps 4 comfortably In town for work ask about our extended stays! About this apartment: High speed internet with free Netflix, Hulu and amazon. It has everything you need for a nice and enjoyable stay. The Bedroom has a queen size bed and an extra roll away bed in the closet. It has two Living rooms with two comfy couches and a Roku TV, a full size kitchen, two full bathrooms and a stackable washer and dryer. Sleeps 4 comfortably About this apartment: Includes: Free high speed internet with Hulu, Netflix and amazon. - The kitchen has everything you need from pots, pans, plates, bowls, cups and glasses. It has full appliances for your stay. There is nothing that you wont find in this cozy little place. -	The Bedroom has a queen size bed with comfy blankets and pillows. It has a dresser with many drawers for all your belongings and an chaise lounge couch big enough to sleep on. -	Living room has a comfy pull out couch with a Roku TV and Table to enjoy meals. 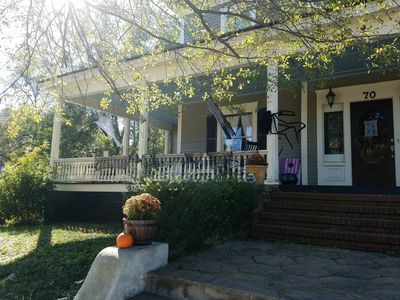 Our award winning, beautiful plantation style guesthouse is conveniently located just an hour west of downtown Atlanta within our 57 acre equestrian farm and only 10 minutes south of the beautiful college town Carrollton. The house sits across a small creek in a wonderful quiet area, surrounded by shady trees and the beauty of nature. It’s a real treat and the perfect port for your family and holiday vacation, romantic getaway, family re-union and even business people. The front and back porch area provide splendid views of the surrounding nature. The fresh and cozy furnishings add to the atmosphere of rest and relaxation. You will love the quiet privacy of this vacation home! The main floor (sleeps 6) of the house is designed in an open living concept with a very spacious living/kitchen/dining area including an open fireplace. On the same floor you will find the large master bedroom, which is equipped with a king bed and a brand new, super comfortable Tuft and Needle mattress. The luxury en-suite bathroom includes dual sinks, shower and a large garden jet tub. Two queen bedrooms with a shared full bathroom complete this level. 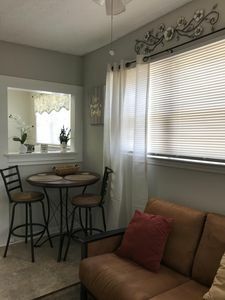 The lower level floor can be booked for an additional cost and offers a 4th bedroom (sleeps 2), another large/full bathroom and a roomy entertaining area with TV and kitchenette (see rates for details). You will have access to a beautiful year round open salt-water pool, which is located only a short walk across the creek at the main house. A jump from the diving board or just a refreshing swim will help you replenish after a long day at work. Or trot on by the barn and take a riding lesson to free your mind, body and soul! Sometimes a good night out is a good night in. 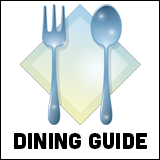 Carrollton has some of the best restaurants around but dining out all the time can be costly. The full kitchen offers you an alternative. Stock the fridge with your favorite food and drink and enjoy an evening to yourself. Better yet! Enjoy a fabulous dinner and don’t worry about what to do with left overs. Bring them back here to your house for later. Downtown Atlanta, Georgia walkable attractions loop is where you can see the world of coca-cola, Georgia aquarium, inside CNN Atlanta and imagine it! The children’s museum of Atlanta, all circling centennial Olympic park. Atlanta attractions will help you get back to nature at zoo Atlanta, fern bank museum of natural history and stone mountain park. Find famous atlantans at the martin Luther king, Jr. National historic site, Margaret Mitchell house and jimmy carter library & museum. Georgia’s “little grand canyon” is a testament to the power of man’s influence on the land. Massive gullies as deep as 150 feet were caused simply by poor farming practices during the 1800s, yet today they make some of the prettiest photographs within the state. It’s located just 90 minutes from the guest house south of Columbus. For more pictures and info check out our webpage. No pets. 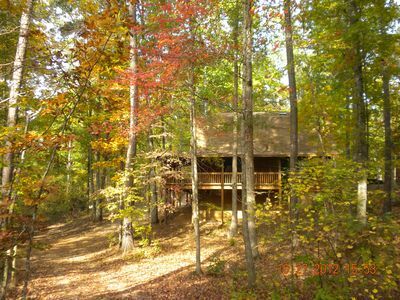 6 miles away from Callaway Gardens.Quiet, peaceful cabin on 135 acres. Has internet, Build a fire in the wood burning fireplace and curl up for a relaxing time.Outside cooking Pavilion has two ovens and a Fire pit, all use Charcoal. Watch your favorite sports on the 52 inch Plasma TV.House is 2 stories with a barrel tile roof. Jacuzzi in Master bathroom.granite counter tops, Tongue and groove walls, Deck below and above master bedroom looks over the pond that you can fish in. Their is 2 bedrooms downstairs, one has a king size bed and the other room has a queen, go upstairs and a king bed is in the master bedroom and go down a hall to 2 more rooms that have a queen in one room and a twin and a single bed in last room. Visit Callaway Gardens which is 6 miles away. This place has so much to do and I hope you can all see it all! “LOVIE’S ON THE LAKE” RESORT LAKESIDE LOG CABIN NEAR POOL & TENNIS COURT. “LOVIE’S ON THE LAKE” IS A 2 BR 1 BATH LOG CABIN WITH A PRIVATE JACUZZI ROOM LOCATED ON THE 8 ACRE FISHING LAKE NEAR POOL & TENNIS COURT. 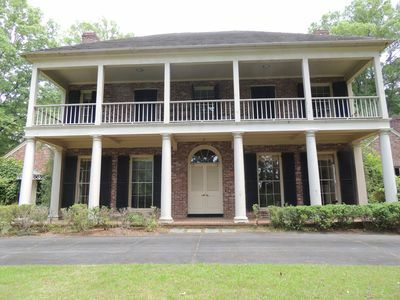 COME “STEP BACK IN TIME WITH US” AND VISIT THE OLD TOWN OF PINEVILLE GA. WHERE OUR PINE MOUNTAIN CABINS ARE LOCATED. THIS RESORT AREA IS LOCATED 2 1/2 MILES NE OF THE TOWN OF PINE MOUNTAIN GA, CALLAWAY GARDENS AND WILD ANIMAL SAFARI PARK. (Weekday rate special Monday through Thursday $135 per night + tax.) FOR MORE INFORMATION CALL PINE MOUNTAIN CABINS 706 663 8790. 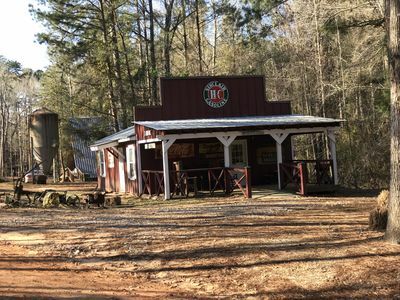 “Step back in time with us” in the “Ole Country Store” in Ole town Pineville Ga.
“Step back in time” and stay in the “Ole Country Store located in the Ole town of Pineville, Ga in a private resort. Just 2 1/2 miles NE of the town of Pine Mountain, Ga. 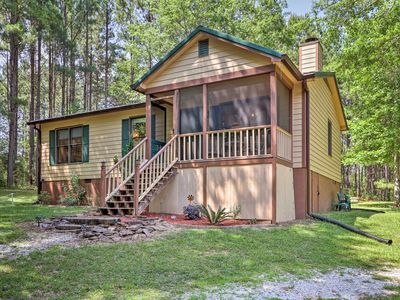 This cabin is a 2 BR 1 Bath with a Queen pull out couch, full kitchen, full bath with a Hugh covered front porch with rocking chairs. 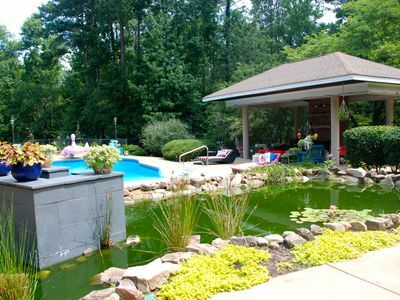 Located just minutes to the 8 acre fishing lake, swimming pool and tennis court. We are also located 4 miles N of Callaway Gardens, Wild Animal Safari Park, Roosevelt State Park and 17 miles from Warm Springs, Ga. (Weekday rate special Monday-Thursday $125 per night + tax). For more information and specials, call Pine Mountain Cabins 706 663 8790. Welcome to The Front Porch, where memories are made. The Front Porch is circa 1907. This home has all the charm of a typical home of this era. 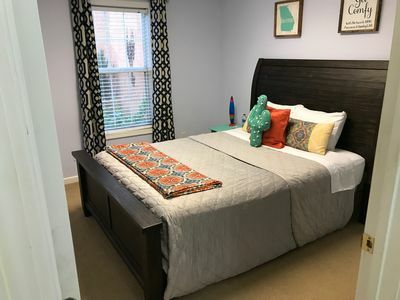 It is walking distance to the Newnan Square, 20 short minutes from Serenbe, 5 minutes from The Cancer Center, 30 minutes from downtown Atlanta, 20 minutes from the Walking Dead and 25 minutes from Hartsfield International Airport. The Front Porch is designed to be lived in, enjoyed & for making family memories. This 3400 Sq Ft. Home is perfect for family gatherings. There is dining seating available for 18, a well equipped kitchen for entertaining, and plenty of space for all to find their perfect little hideaway. This is the perfect venue for wedding parties or family reunions. The yard is large and the front porch comfortably seats 14. We also have a concierge service at your request. The refrigerator can be stocked upon arrival, fresh flowers can be distributed throughout the home & onsite catering can be arranged. Come make some memories at the Front Porch. Ranch home is fully furnished, in a golf community in Newnan, GA. Two bedrooms with 3 beds. Master has one king size and spare has bunk beds (one full bed, one twin bed) 2 full baths. Cable, wifi, stainless steel appliances, & dog-friendly home make for a comfortable & peaceful stay. 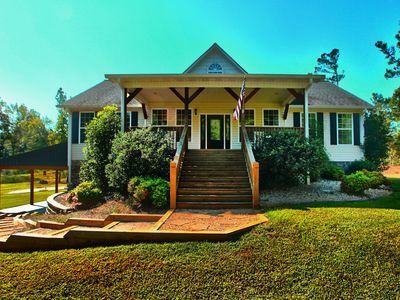 The space Enjoy our quiet, lovely ranch home in one of the premier golf neighborhoods in Newnan. This 2 bedroom (1 king bed, 1 bunk bed with double and twin beds), 2 full bath house come with stainless steel appliances, dishwasher, microwave, coffee maker, and full size washer/dryer. Flat screen TVs, wifi, cable and ceiling fans throughout the house. Entire house has laminate flooring (no carpet). Secure fenced in backyard with doggie door for your little four-legged family member's convenience. 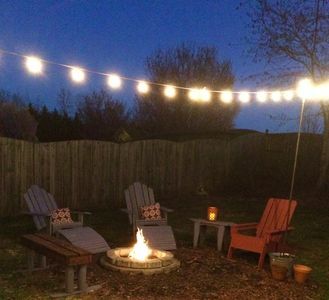 Relax in the peaceful back yard equipped with a gas grill, patio table and chairs, hammock, fire pit and string patio lights. Guest access You will enjoy the convenience of this 2 bedroom/2 bath ranch home, with two car parking in the driveway. Interaction with guests Check-in: You are free to arrive after 3pm. You will receive check in instructions once you secure the accommodations. I respect your privacy, yet I am always available by phone, text, email, or Vrbo message if you need anything. House Rules: • Check-in time anytime after 3PM with a keyless code lock. No smoking at all please. No drugs of any kind allowed. No parties or large gatherings. This is a very quiet and family oriented neighborhood so please be respectful of that. Well-behaved indoor pets are welcomed with a max of two. Please try to keep the pets off the furniture. Prior notification of pets is required. Pets must be on a leash 100% of the time in the front yard or while out for walks in the neighborhood. Please pick up after your pet while out in the neighborhood also. Simply be respectful and treat our happy home like you would your own. 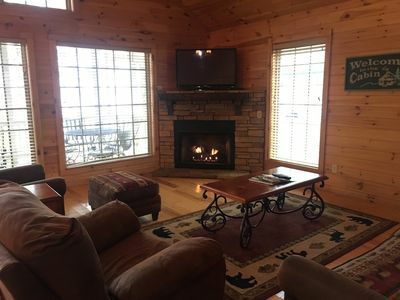 Perfect for your next getaway whether it's a romantic weekend, friends' trip, or simply a family vacation; Eleanor's cabin is the right place. 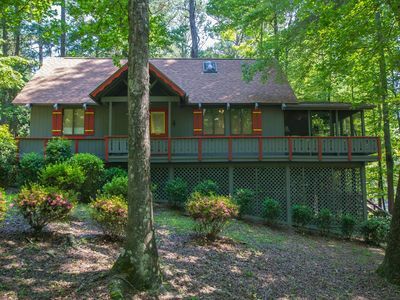 Located only a few miles from both Warm Springs and Callaway Gardens, this beautiful cabin sits on 6 private acres. Eleanor's cabin provides stunning views of the South Georgia countryside, but puts you within a short driving distance of many attractions. Sip your morning coffee on one of the large porches, grill a meal using the custom outdoor kitchen, or enjoy some quality time inside this warm and cozy home. The home has two bedrooms (1 king, 1 queen), 3 full bathrooms, and a loft with a pull out couch. 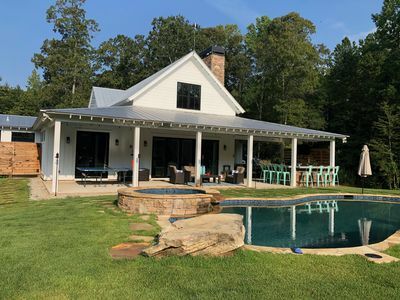 You will also find a gorgeous fully stocked kitchen, screened in outdoor eating area, large front porch, gas fireplace, two living rooms, and sweeping views of South Georgia. Eleanor's Cabin is exactly the place you want to spend your next vacation and we cannot wait to share our hideaway with you. This space is the entire bottom floor of our home. Private access entrance. 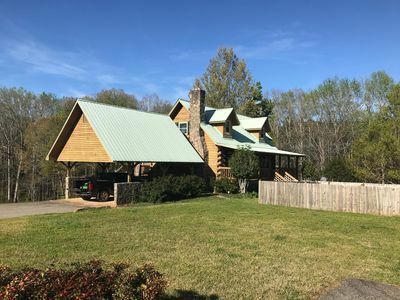 Three bedrooms , two bathrooms, common living area with pool table, Tv , patio lake , access to dock , 25 acre lake,2 paddle boards, 2 paddle boats, catch and release fishing , hiking, bicycles. We have small refrigerator and coffee. There is NO WIFI, cell service is available with your own personal hotspot. Verizon is best . We have a dog that accesses all areas of the house. Bayview at Clearwater. The most beautiful view on the lake! 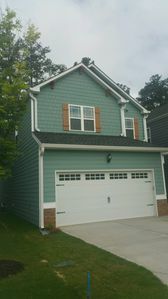 Bayview at Clearwater is close to Newnan, Senoia, Peachtree City, Atlanta, Callaway Gardens, Reets Drying Academy and the Cancer Treatment Centers of America. You'll love Bayview for its serene lake views and quiet surroundings. Great for fishing off the dock if you bring along your favorite fishing pole. Or swimming in the pool (May through September) or lazing in the hot tub. It's great for couples, solo adventurers and business travelers. Please note that Bayview is a private upstairs apartment accessed by a flight of stairs to your own private entrance. This is a one bedroom apartment with a king size bed and a pullout queen sofa in the living room. Check out our reviews on Airbnb. LONG TERM STAY WELCOMED! Starting at $500/month! Beautiful 3 story townhome! Large space- 2000sqft! 2 minutes away from shopping centers and several restaurants. Room includes 1000+ channels with recording DVR cable and Wi-Fi. 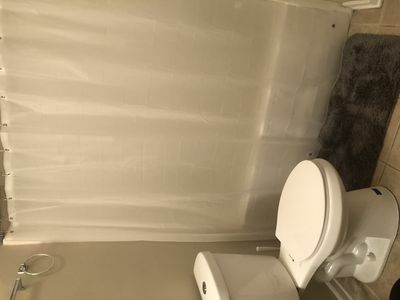 Shared bathroom with a long term tenant. 2nd floor bedroom. Washer and dryer on the property. 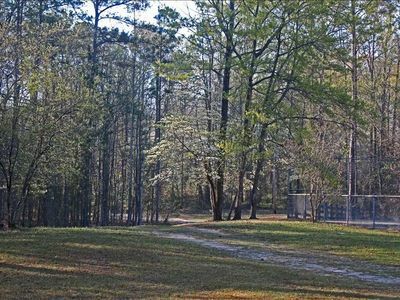 ($5 per load) Basketball court and huge driveway behind the property. I also offer clean linens, shampoo, soap, and toilet paper, coffee, and water! Guests are sure to enjoy a memorable visit in this fully furnished, 3 bedroom/2 bath house. Space is a comfortable 3 Bedroom with queen pillow top mattresses. It can accommodate up to 6 guests. 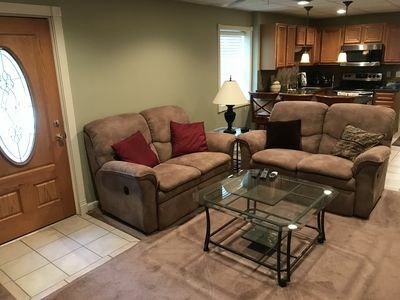 The spacious living room is furnished with leather couches and a 55 inch smart TV access to Hulu and amazon prime. The kitchen is perfect for dining as it is equipped with stove, Microwave and refrigerator - All cooking, dinnerware and cooking utensils provided. There is a deck area to unwind and take in the beautiful nature watch the variety of beautiful birds at play. The property is just minutes away from all of the best attractions, and guests are sure to enjoy having the whole home to themselves. 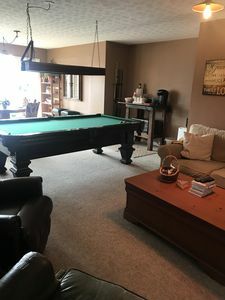 There is a basement apartment that is not included I may use occasionally while I am in town, for one or two days at a time. The garage is not included. 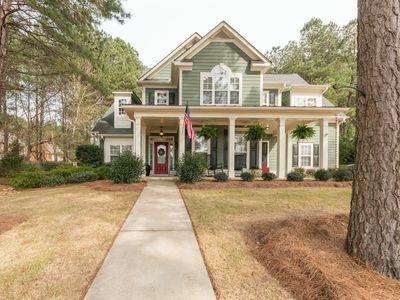 This beautiful, open floor plan four bedroom, 3 1/2 bath home is ideally located in the country side of Senoia, GA. It is perfect for a couples retreat or large family vacation. Master suite includes king size bed with private ensuite bathroom. Bathroom has a large soaking tub, shower and access to a full outdoor bathroom! Two additional guest rooms with queen size beds and one room with twin bed + crib. Home sits on 24+ acres with a large salt water pool and hot tub for 8+ people. Property features two creeks onsite for exploring. The outdoor living space is ideal for any occasion. Outdoor kitchen features green egg, gas grill, sink and plenty of work space. There are also two outdoor TV’s and an outdoor wood burning fireplace. 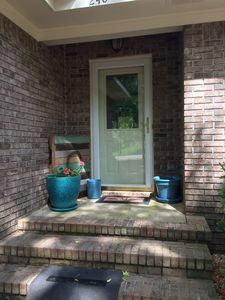 Location: 10 minutes from Downtown Senoia 25 minutes from downtown Newnan 25 minutes from Peachtree City 40 minutes south of the Atlanta airport 1 hour south of Atlanta Additional amenities: Fiber wireless internet access Back up generator Kids playroom Fully equipped kitchen Linens provided This property is a completely smoke free home. No smoking or vaping of any kind is allowed on premise. Any guests found smoking or vaping will be charged a $250 fee. Whether you plan to celebrate a honeymoon or anniversary, or enjoy a few days of "family time", we welcome you to Casa Cardinal. 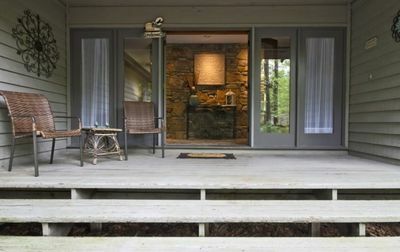 Rock on the porch, or go for long walks in the woods, then enjoy cooking in a completely outfitted kitchen. Savor the sounds of nature, or watch your favorite games on satellite TV. This is a custom built cabin offering a peaceful retreat! and located, literally, at the end of the road at Mountain Top. As you'll see from the most sweeping porch in the resort, cardinals, hummingbirds, deer and other wood critters appreciate the remoteness, and so will you. All year 'round, you'll enjoy the ever changing panorama from the porch rockers and swing: spring blooms, summer shade, or cascade of fall color. If you're a winter hiker, you'll return to a roaring fire in the stone fireplace, and a therapeutic soak in the double jacuzzi. 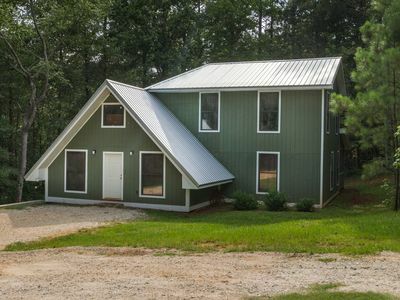 Two bedrooms, two baths and a loft - sleeps four adults and 3-4 children comfortably. The decor is comfy without being too frilly, or too "country"... just your "home away from home". The entrance ramp and interior, master bath and bedroom, were built to accommodate guests with mobility restrictions on the first floor. On a rainy afternoon, the upstairs loft provides a comfy reading nook, skylight and a second full bath. Fully furnished for a weekend, or a few weeks, "mi casa es tu casa". Casa Cardinal is located only a few miles from Callaway Gardens and Warm Springs, and provides a picturesque setting, spacious living, two bedrooms which sleep up to four adults and two children; a kitchen with full sized stove, refrigerator, microwave, and coffee maker, and all the cooking and eating utensils you’ll need! Kim, Ali and Stefani invite you to share our take on tranquility. 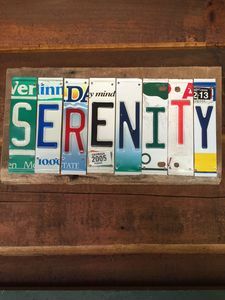 SERENITY COTTAGE - The name says it all! 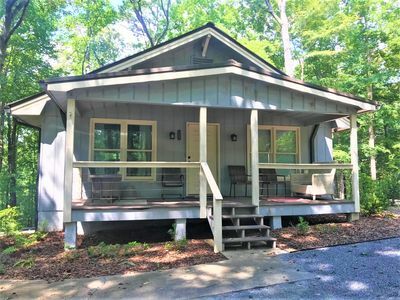 Whether a romantic getaway, or a place for the family to just get together and reunite, you will find this cabin the perfect peaceful retreat. This cabin is nestled in the woods in the Mountain Top Resort area of Pine Mountain/Warm Springs. 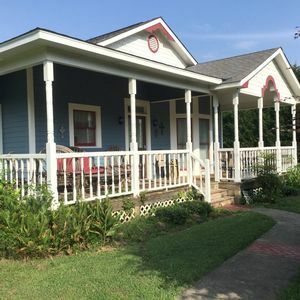 Come and relax and enjoy all the sights and sounds of nature while you swing on the front porch, relax in the screened porch or sip your coffee while listening to the creek off the (no outside access) side deck. 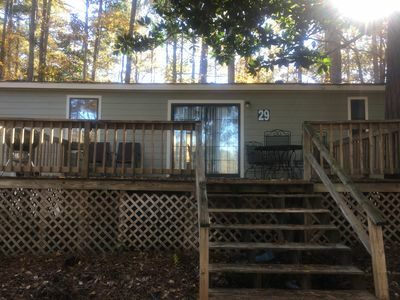 This cabin is located just a short drive to Callaway Gardens and Warm Springs. It is also a few miles to Mountain Top's Wedding Chapel and Lodge. Choose from relaxing in the garden Jacuzzi, catching up on some reading or going hiking. With so many things to do, these are just a few to pick from. Once you have enjoyed your day, feel free to cook in our fully furnished and well equipped kitchen. Curl up after dinner and watch a movie or favorite show with satellite TV in our spacious living room while enjoying a fire in the fireplace. Then retire for the night in one of our 2 bedrooms furnished with queen beds. The loft is furnished with a trundle day bed that will sleep two children comfortably. Come make our home away from home your getaway!! 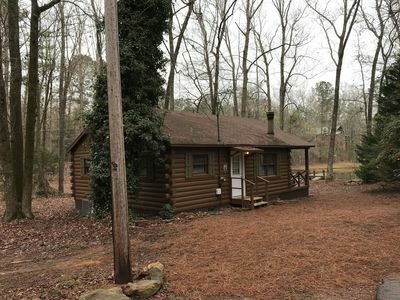 Log cabin near Roosevelt Park and Callaway Gardens, Non Smoking, prefer no pets. Log cabin sleeps 14 people with 3 bathrooms. 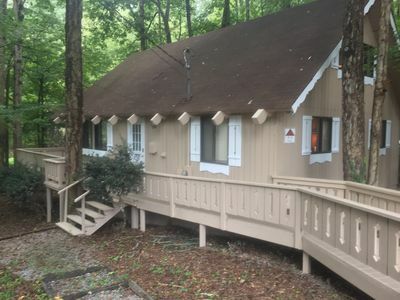 Just over an hour southwest of Atlanta where there are no crowds Serenity Cabin is the place to go for a mountain getaway. While there are numerous great restaurants in the area, our kitchen has all you’ll need to prepare meals in the cabin, just bring your food and condiments. 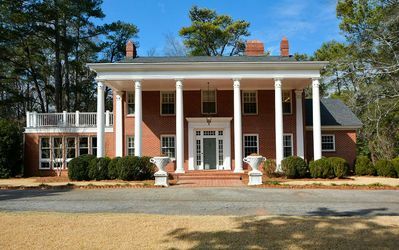 Callaway Gardens is within 15 minutes from the cabin and so is the Roosevelt National historic site, “The Little White House.” There are many hiking trails nearby with horseback riding stables too. 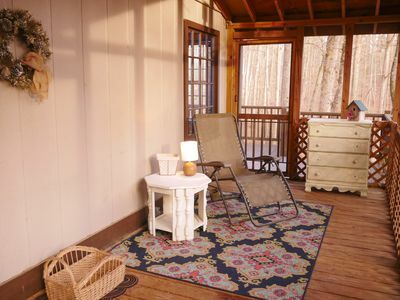 Come relax on the back porch and enjoy this great vacation spot. There are 2 king size beds, 4 queen size beds, and one double size bed. Our cabin is perfect for families who want to spend time together. We tend to shy away from groups of young people without adequate adult supervision. 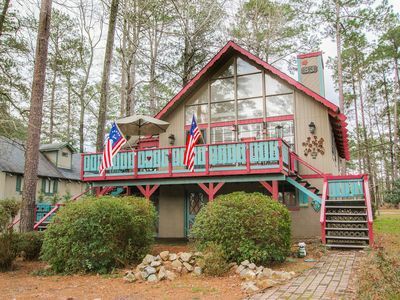 Rustic Cottage in Pine Mountain, GA "The Wolf"
Greetings, The Wolf Cottage in Pine Mountain, GA is a stylish, cozy and rustic cottage located in a quiet and secluded rural neighborhood that borders the backside of FDR state park. The cottage is a short drive to Callaway Gardens and the historic center of downtown Pine Mountain. We welcome guests that will abide by house rules and rental agreement. The rural neighborhood that the cottage is located in has full time residents, so respectful guests and their visitors are welcome. The Wolf Cottage sleeps 4 guests and has an electric fire place. The cottage is very near FDR State Park, in a quiet rural neighborhood. Guests will have the cottage to themselves. The cottage has two bedrooms, one bath, open space kitchen, dining and living area. There is a queen sized bed in bed room 1, a full sized bed in bed room 2, and a Japanese style floor mattress is provided... with space to sleep on the living room. 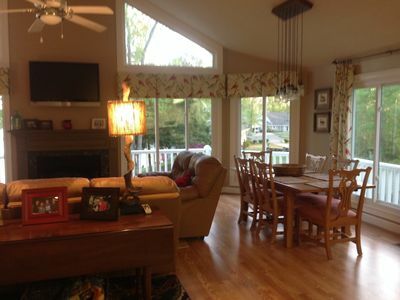 The cottage also has a screened in porch and a back deck. There is parking for two vehicles only. Low hanging utility lines are above the cottage parking spot, so guests can not bring and arrive in over height vehicles. Over height vehicle examples: RVs, motor homes, Winnebagos, etc.. Guests cannot setup camp/tents on the property, or facilitate extra guest by bringing RVs, motor-homes, Winnebagos, pop up campers, sleeper vans, etc. Do not bring trailers that are hauling four wheelers, motorcycles, go carts, golf carts, side by sides, etc.. What is provided: Japanese floor mattress wireless internet (WiFi) DVD player electric fireplace kitchen utensils: to eat and cook with pots and pans baking trays, muffin pans, pizza tray oven/stove/toaster combo microwave fridge/freezer coffee maker small toaster oven water filter pitcher salt and pepper dish soap hand soap shampoo, conditioner, body wash A first aid kit is in the cottage. Guest need to bring their own EpiPens and any allergy medication if you have a known or unknown allergy to wasps, bees, any outdoor seasonal allergies, etc... The cottage has smoke alarms, carbon monoxide detector and fire extinguishers. 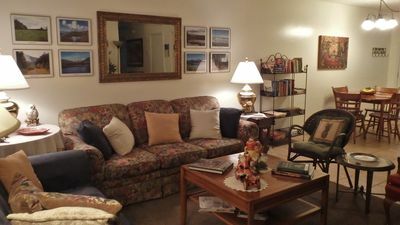 What is provided: cable tv, wireless internet (WiFi), electric fireplace, the kitchen has utensils to eat and cook with. There's an oven/stove/combo, microwave coffee maker, and small toaster oven, water filter pitcher, salt and pepper. Paper towel, toilet paper and make up wipes and towels will be provided as well.